I ran Lady Blackbird by John Harper four times on GothCon XXXIV. After a while I developed a feel for the game, and the form described in the game meshed with my own playstyle and experience from running other indie games. I wrote a short post on the Nordnordost blog about actual play of the game, and in the comments we had a discussion with advice for running it. I thought I’d share those advice here as well. I don’t think that reading this post will spoil the fun of playing the game later. Since all there is in the PDF is a situation (and not a full adventure as such) that is also known by all players by the start of the game, anything that was part of my games will not necessarily figure in the games of others. For reasons that will become apparent. As I already mentioned in my Reading Lady Blackbird post the short section on how to run the game contains the suggestion to run the game by asking questions, and not planning ahead. This may seem a bit thin, but once the game actually starts it all comes together. As you may know, the game starts with all the PCs being held in the brig of the frigate The Hand of Sorrow. After the players introduced their PCs (meta level introductions, as all the PCs already know eachother), I just turned to a random player and asked him or her to describe the cell that they were held in. After the description, if they did not start playing by themselves, I asked what they were going to do about the situation. And it turned into a flurry of activity as the PCs were finding a way to get out of the cell. Usually breaking out of the cell involved someone picking the lock, or even some magic, but whatever means they took it was an appropriate time to describe the dice mechanism/rules, and how abilities, tags and the pool work. After all, we had a very real and practical example to work with. Once outside the cell, if the players had not already taken command of the game, I asked the player that had been the least active one what they were hearing, or if I wanted to get things going with some minor combat what the patrool that just came through the door looked like. The event usually caused another episode of frantic activity of some kind or the other, and when the game began to settle I followed up with another question to whatever other player that had been quiet. Whenever they forced themselves to roll dice to do something, gamers like to roll dice to do stuff, I assigned difficulty. The difficulty 3 is good, I went through entire sessions using only that. Sometimes in the last parts of the sessions all I had to do was to reply ‘Three!’ when prompted about the difficulty of doing this or that. After playing for a while and finding that whatever they said was established as true in the game the players started GM’ing themselves. Sometimes I did short sections of traditional GM narrative, but usually with some form of question to the players at the end, to put the ball back in their hands. After running the game a few times I wanted to share cool episodes with the following game groups, that is planning the game. That did not work out very well. Since I was suddenly aiming for a goal further off than the next minute of gaming I started saying ‘no’ when the players did stuff, since I wanted to save my own plan. Such ‘blocking’, as the impro crowd calls it, made the game slow down. It is hard to give up on a plan once you have it, so my suggestion is not to plan at all, just like John says in the GM’ing section of the game. I just advised against saying no in the previous section, but as a GM you should be prepared to do it anyway. The game is very free and open, since you are mostly running it by asking the players what comes next. But for the game to work, the stuff that the players come up with must fit with the other pieces already in the puzzle. When the impro crowd talk about ‘being obvious’, they talk about this. Every player will have an own agenda, and an own view of what the world looks like, and what the game is going to be about and contain. As a GM you should focus on keeping a finger on the pulse of the game so you notice when someone says something that breaks the beat. Some minor things you can just let slide, but if someone says something that clearly puts the other players off, then is the time to act. Say no, or find another way to reach the objective that the player has, but that does not upset the game for all the other players. This is tricky, if you get it exactly right everyone is happy. Don’t be surprised if you don’t get it exactly right. The game goes on anyway, move on, cut to the next scene and forget it ever happened. Running a game by asking questions is easy, keeping everyone on the same track can be more difficult. That is, in TSOY and SS you should keep an eye on those keys. In Lady Blackbird the keys tells the player who the PC is. Same name, different thing. My advice to a GM is, don’t worry about the keys, let the players do with them what they please. 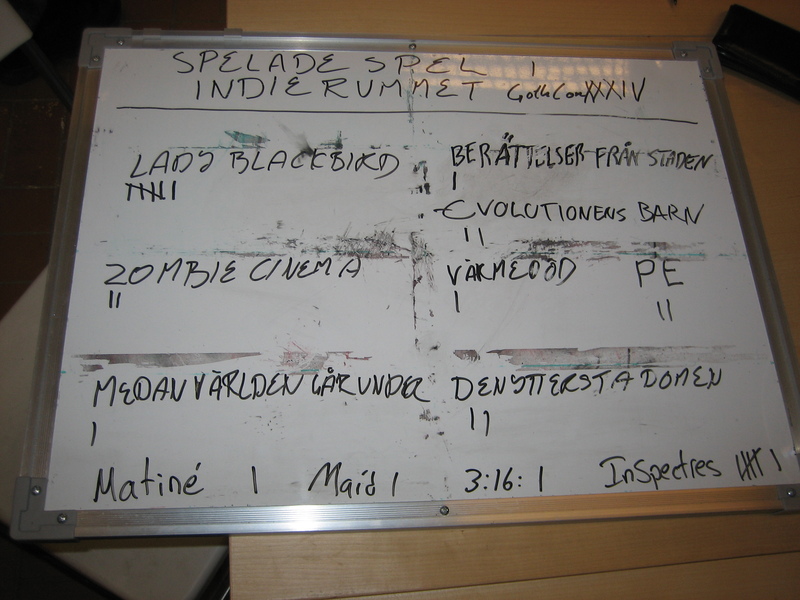 Just a short summary of the gaming in the indie gaming lounge (Indierummet) at GothCon XXXIV. GothCon is Sweden’s biggest con, with 1500-2000 visitors every year. I have not seen any exact figures for this years attendence yet though. It is not strictly an RPG con and has huge sections dedicated to Magic CCG and Warhammer minis too. And there are workshops, boardgaming and all other sorts of nice geeky things going on at the same time. The indie gaming lounge has been around for a few years, and even if I am considered one of the regulars these days I did not see the early years. This year we had two gaming tables set up in the lounge itself and games often spilled over into nearby corridors when there were many guests. This year there was a lack of game masters for other RPG events, providing a steady flow of full groups of players coming looking for drop in games. I’m sad to say that we had to turn away as many players as we could accomodate. The arrangements around the lounge were a bit chaotic this year and it was only a few months before the con that we knew for certain that there actually would be a lounge at all. As usual the lounge had the pot-luck-gaming going where all game masters bring whatever games that they want to run and put them on a table for display. Guests can then browse the games and ask questions, if they want to play something one of the available game masters asks for preferences and then tries to find a suitable game and then the game is on. The last day of the con I tried to make a record of everything that had been played in the lounge. Some games might be missing as the game masters embrace the drop in character of the lounge and only show up when they feel like it. Berättelser från Staden – Playtest of the new version. … well, Lady Blackbird… I ran that game four times and with good results every time. It taught me a thing or two about game mastering, I’ll have to write another post about that sometime. Also Arvid hooked us up with a great place to sleep, infinite kudos for that. I have never been as rested and full of energy at GothCon before. http://www.gothcon.se/oldweb/thexxxiv/… – The indie gaming lounge entry on the GothCon site. Lady Blackbird is not a book, but rather a booklet at it’s sixteen pages, of which ten are character sheets for the pregen characters that come with the game. There are a few illustrations, all done by John, and all very nice. The game consists of a situation, that will lead into an adventure, but that adventure is not described but will have to be filled in by the GM along the way; some characters and a set of rules that binds everything together into a playable whole. Reading the whole thing just takes minutes. The setting in Lady Blackbird is some sort of steam punkish Firefly mashup. And it is given more of an overview than an actual description. There are only two pages worth of setting, the first is also the game’s first page and describes the situation – Lady Blackbird, her bodyguard and hired crew have been imprisoned in the hold of an imperial battleship. The second is a very short, but illustrated description of the game’s setting, only covering places where the lady might go once she has broken out of her captivity. The rules are rather light, and do not cover every situation imaginable. There are ability checks, Solar System-like keys (that generate XP) and Secrets (that bend the rules). Roll a number of D6s, 4+ are successes, get at least the difficulty number of successes to succeed at the task. Fairly simple. There are no rules for character generation, but the game comes with five pregens; the lady, her bodyguard, a ship’s captain and his mechanic and pilot. The lower half of each character sheet contains the full rules of the game. The players are tasked with managing most of the rules themselves, the GM is really only needed to set difficulties of tasks and assigning conditions (damage) to the PCs in the case of failures. If I had wanted to run Lady Blackbird as an extended campaign the fallacies of the system and lack of detailed setting would have posed problems, But if the objective is to run the game as a one shot I think that there is enough material in those 16 pages. We are given just the bare bones of a setting, but there is enough to last three or four hours worth of play, which is OK. The rules are lacking, but they cover the situation that can be expected to pop up in the first hours of play at least, and cover them well. At least for someone who has experience with other indie RPGs, like TSOY/Solar System or the Burning* games. A complete beginner would find the instructions incomprehensible. The form is excellent, everything fits together. Actually I already did, I ran the game four times at GothCon and had a good time. I will put Lady Blackbird into my bag of indie/story games and take it with me to future cons. But I doubt I will try to run the game at home for the regular bunch of players given their preference for campaign play. www.onesevendesign.com/ladyblackbird – The official Lady Blackbird site. imbuildingsomething.blogspot.com – Arvid’s blog on psychology, impro and RPG theory.